The plan focuses around three different zones of function, which connect the two cities together. These functions are residential, commercial and leisure. The functions create rings that connect the two cities and form a marriage between them. “Marriage of two cities” values the old spirit of the cities and highlights it even more. Everything that is possible to preserve will be kept in place. This makes the plan very easy to implement and doesn’t require excessive amounts effort and resources to accomplish. The old orthodox church will be kept in place and highlighted with greenery renovations and area development. The old school buildings will be turned into assisted housing. The old commercial building in the coast will be transformed in to a fishing and travel center, which supports the Rajakaari leisure functions. The Rajakaari area will be the new center of leisure in TornioHaparanda. The existing circle figure of Rajakaari will be highlighted even more. 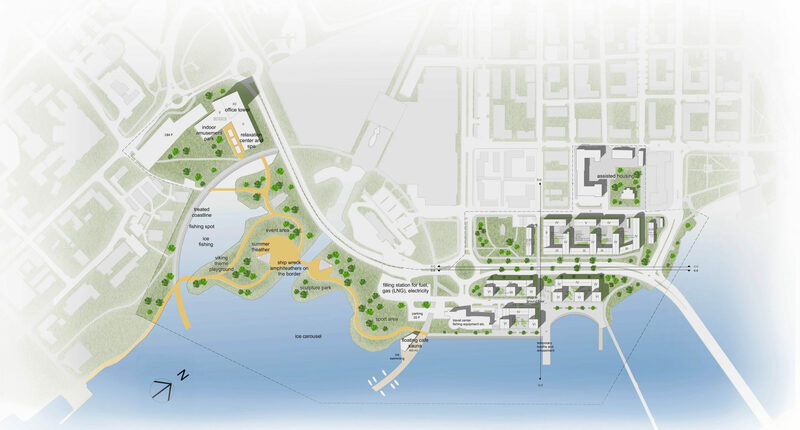 The sides of the circle will include a new curved pier on the Tornio side and a treated curved coastline for benches and fishing spots on the Haparanda side. On the Tornio side there will be a new floating building that includes a restaurant and public sauna. The new center spot of Rajakaari will be in the border of the two cities. This border area will be a place for people to meet and an attraction for tourists to see. On both sides of the border there will be small structures that represent ship bows. Along with the ship bows, there will also be a playground with a viking theme. A few new bridges will be built to make the Rajakaari area navigation smoother. The commercial zone is located in the Haparanda side of the border. It supports the leisure activities in Rajakaari, but also provides new commercial activities for the area. The main commercial attraction is the new building complex that features a spa for the adults and an indoor amusement park for the kids. There is a new main path from the Tornio center to the coast that goes past the E4 road. It will be a pleasant walking path with greenery and small shops in the ground floors of the buildings. 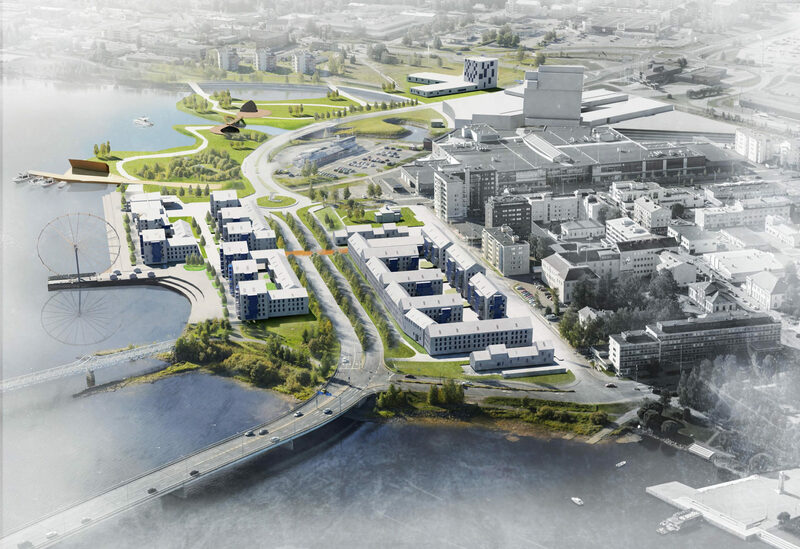 On the coastline of Tornio River there will be a new housing area, that’s going to be the best in Ocean-Lapland. The buildings are situated so that they create the maximum amount of views to the river. In the new residential buildings some of the cars will be shared with the residents, which reduced the requirement of parking spaces.